If you’re a parent, you already know that raising a child is one of the hardest, yet most rewarding tasks to take on. That’s why it’s necessary to have a strong and supportive community around you. Thanks to your donations, parent participants of the CFS Community-Based Parenting Education program are able to receive all the education and knowledge they need. The program is offered to everyone, and is completely free, thanks to donations from the community. Through comprehensive classes with evidence-based models, the program strengthens the nurturing relationship between parent and keiki by incorporating valuable Hawaiian beliefs of loina (tradition), ohana (family), lokahi (harmony) and aloha (love). The program also educates parents on where they can find and receive help through community resources. 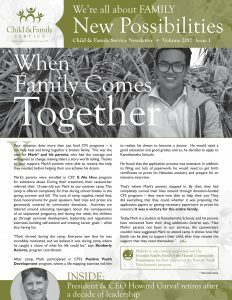 This article appeared in the 2017 CFS “New Possibilities” Donor Newsletter V.1. Click here to view the online version of this newsletter.